For the past nine years, Gary, a father and a resident of Santa Cruz, did not know what was wrong with him. By the time he was diagnosed with an autoimmune illness and began his long road to being himself again, Gary had lost a lot of time. Once healthy, he struggled to find work, and, without stable income, Gary eventually lost his housing. Gary began staying at the Paul Lee Loft, remembering, “I needed a leg up. The loft gave me food, shelter, and a place to shower.” Homeless Services Center connected him to services and referred him to the Rapid Re-Housing program. Rapid Re-Housing began working with Gary on his search for employment and housing. 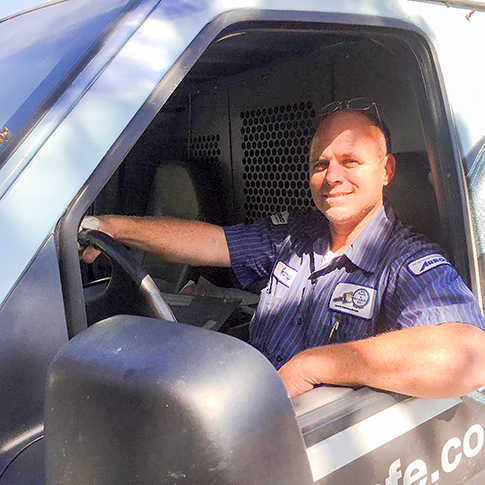 He found work through a temp agency, and his background as an alarm technician quickly gained him a full-time position for a local locksmith. With the help of Rapid Re-Housing, Gary moved into permanent, stable housing a month after arriving to the Paul Lee Loft. A few months later he was able to move into a slightly larger unit on the same property and he now shares it with his teenage son. He sees his kids on a regular basis and this summer Gary was the official grill master for his kid’s little league team. He shares that he is thankful for the support he received while at HSC.